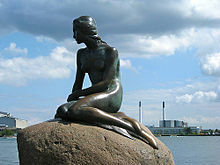 Ariel the Little Mermaid was the creation of Danish fairy tale writer Hans Christian Anderson (though he simply called her "The Little Mermaid"). 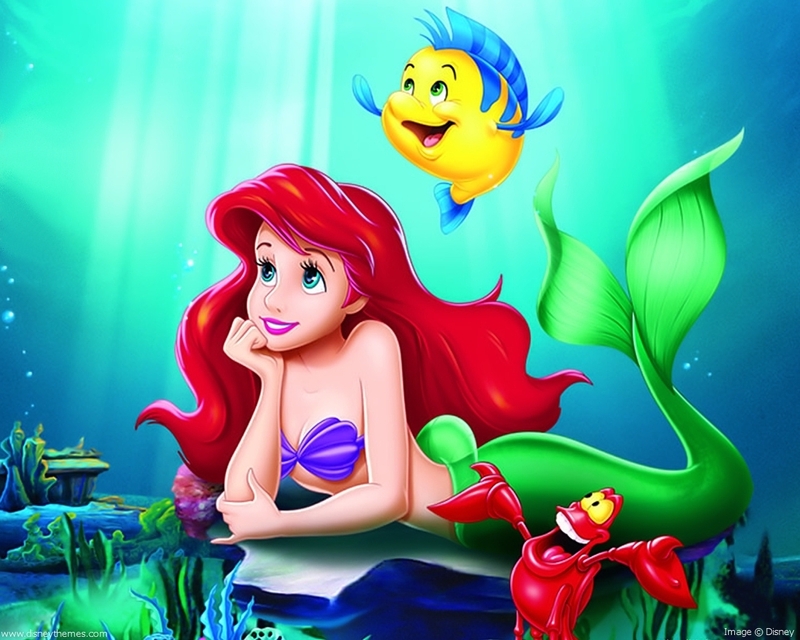 Three Disney movies have featured princess Ariel the little mermaid to date: "The Little Mermaid," "The Little Mermaid II: Ariel's Beginning," and prequel "The Little Mermaid: Ariel's Beginning." Jodi Benson voices Ariel in all of the Disney movies and other appearances to date. Ariel the little mermaid is unique in that she married a Prince, Eric, and has become a mother, to Melody. If you like Ariel, you may want to visit our selection of free printable paper dolls of her here. 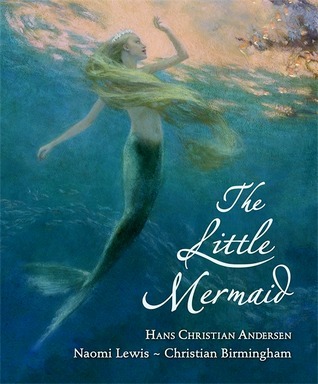 Hans Christian Anderson's Original 1836 Tale: "The Little Mermaid"
The Little Mermaid, who has no other name, lives with her father the sea king, her grandmother and five sisters. The sisters, who are each spaced a year apart, visit the surface when they turn 15 to learn about that alien world. The Little Mermaid is enchanted by their tales of the world above the sea and of people who walk on the land. When the Little Mermaid turns 15, she also goes to the surface to visit. Spotting a ship commanded by a handsome prince, she falls in love. As the Little Mermaid watches, a great storm erupts and sinks the prince's ship. The Little Mermaid saves the prince from drowning and carries him, unconscious, to the beach near a temple. She waits until a temple visitor sees the prince, then leaves before he awakens. The Little Mermaid's grandmother explains that human beings don't live very long, much shorter than their own 300 years. Human beings, though, have souls that are eternal, whereas mermaids simply turn to sea foam. 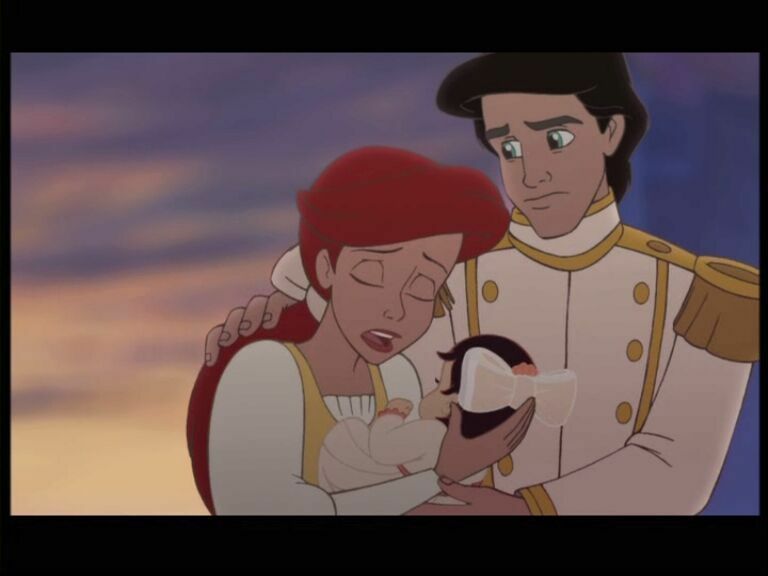 This sets the Little Mermaid to thinking, because she thinks it would be nice not only to be with the prince, but also to have an eternal soul. The Little Mermaid visits the Sea Witch and explains what she wants. The Sea Witch thinks about it, and realizing that the Little Mermaid has a beautiful voice, sells the Little Mermaid a potion that trades her tongue for legs. The Sea Witch explains that once she becomes human, the Little Mermaid cannot return to being a mermaid, and that, while the Little Mermaid will be able to dance better than any human being, she will be in constant pain. In order to get a soul, the Little Mermaid will have to get True Love's kiss from the prince and marry him, for then a part of his soul will flow into her. Should the prince marry another woman, the Little Mermaid will die brokenhearted at dawn the next day and turn into sea foam like all other mermaids. The Little Mermaid drinks the potion and swims to shore and quickly meets the prince, who is enchanted by her great beauty and grace. The Little Mermaid cannot speak, but the prince loves the way she dances. The Little Mermaid dances for the prince even though it pains her greatly. The prince's father, though, orders him to marry a neighboring kingdom's princess, which the prince does not want to do. Rather, he wants to marry the girl who saved him at the temple. In a remarkable coincidence, the girl at the temple turns out to be the princess from the neighboring kingdom, sent to learn the ways of the temple. 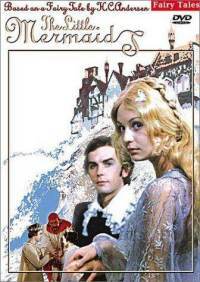 The prince falls in love with the other princess, the wedding is announced, and the nuptials take place . After the prince's wedding, The Little Mermaid is distraught, but her sisters visit her during the night and give her a knife provided by the sea witch. If the Little Mermaid stabs the sleeping prince before dawn, according to the sea witch, and lets his blood drip on her feet, the Little Mermaid will return to her original form and she will resume her life under the sea. The Little Mermaid thinks about it, but she cannot bring herself to stab the man she loves, even though he lies with another woman. At dawn, the Little Mermaid throws herself into the sea and dissolves into sea foam, as expected. However, a curious thing happens: when the sun touches the sea foam, the Little Mermaid turns into a spirit, a daughter of the air. 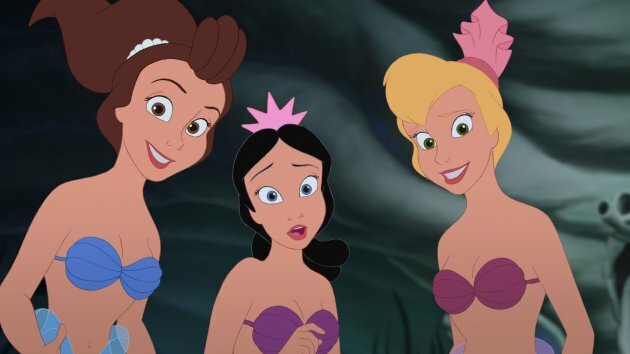 The other daughters of the air explain that, if the Little Mermaid does good deeds for the remainder of her pre-transformation lifespan, she will earn an eternal soul. However, everything depends upon the children of the world. Each good child that she finds will reduce the time until she gets a soul by a year, while each bad child would extend her time by a day. 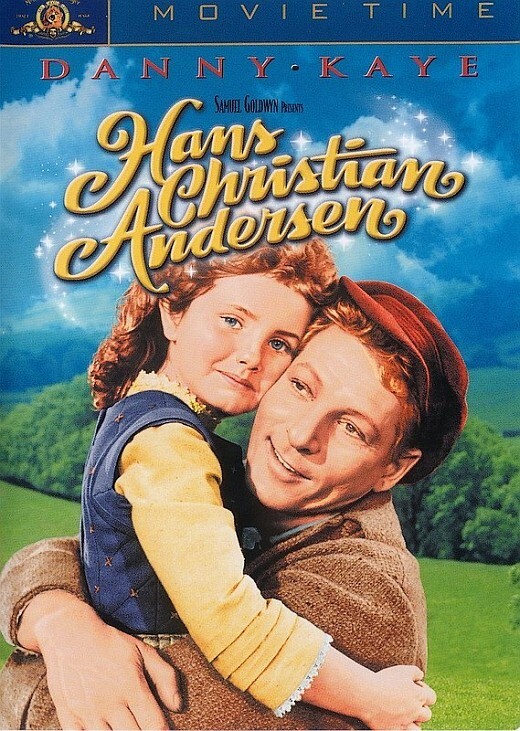 First things first: when Disney decided to make a film about Hans Christian Anderson's beloved heroine in "The Little Mermaid," they looked around for a suitable model. They wanted a cute girl with bright eyes, an engaging smile and lustrous, wavy hair. They finally settled on child star and developing singer Alyssa Milano, then starring in "Who's the Boss" with Tony Danza. The resemblance continues to this day. Alyssa went on to many other terrific projects, but for many, her true immortality rests with a project she never actually worked on, namely, Disney's "The Little Mermaid." 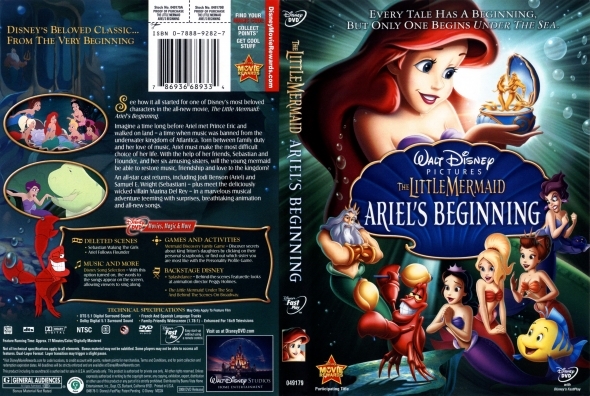 Although "The Little Mermaid: Ariel's Beginning" (2008) is the third film made in the "The Little Mermaid" trilogy, its setting comes first, with "The Little Mermaid" itself second and "The Little Mermaid II: Back to the Sea" the third in line. Given Hollywood's peculiar obsession with prequels, the numbering systems can become a little confusing, but just remember that the last comes first and you'll be fine. 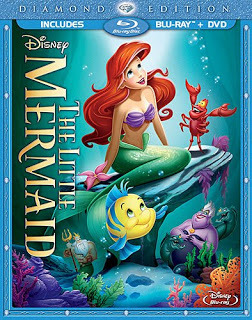 "The Little Mermaid: Ariel's Beginning" by Walt Disney Studios Home Entertainment often is sold as part of a set with the other two films, so if you buy it that way, the order of the three Disney movies becomes more comprehensible. 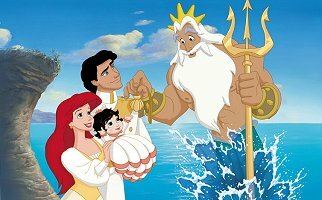 King Triton (Jim Cummings) and Queen Athena (Lorelei Hill Butters and Andrea Robertson) have seven young daughters in their underseas kingdom of Atlantica. 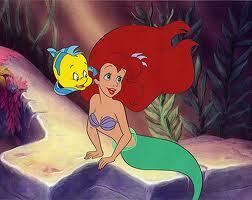 Ariel (Jodi Benson) is the youngest and most precocious daughter. Everybody loves music, and Triton gives his dear wife Athena a music box. While enjoying it, she is crushed to death by a pirate ship. 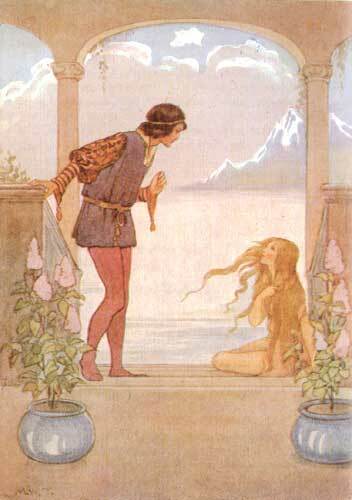 After that, Triton cannot bear the thought of music and banishes it from the kingdom. A new governess, Marina Del Rey (Sally Field), is selected to raise the girls. She and her assistant, Benjamin (Jeff Bennett), look after them diligently, though Marina secretly longs to be Triton's Chief of Staff instead. Ariel in particular resents not being able to enjoy music and seeks it out whenever she can. 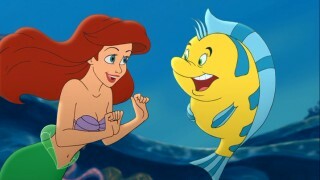 Ariel meets Flounder (Parker Goris), who also enjoys music. He leads her to an underwater music club, the "Catfish Club." To her surprise, she sees the king's chief adviser, Sebastian the crab (Samuel F. Wright), performing. Ariel the little mermaid is delighted to find a place to enjoy her passion. Despite the others' fear that she will reveal their secret, they allow her to join the club. Excited, Ariel later tells her sisters about the club. The next night, they all go to visit. Marina finds out about it and sees her opportunity. 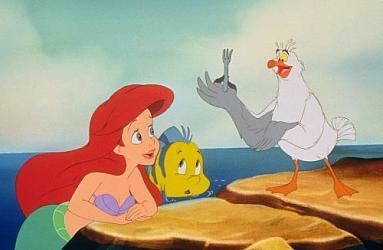 She informs Triton, who throws Sebastian, Flounder and the band in jail and grounds the girls. He promotes Marina to be his chief advisor, the position she always wanted. Ariel confronts her father about the ban on music, but his mind is so made up that he won't even talk about it. That night, Ariel decides to run away. 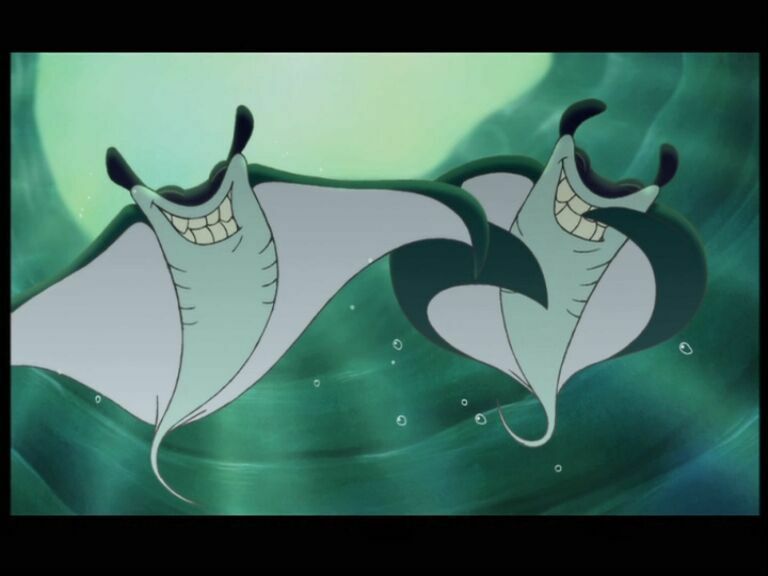 She frees Sebastian and the others from jail and they all leave Atlantica. Sebastian leads them to Athena's old music box, and this inspires her to return the music box to Triton in hopes it will soften his heart about music. Marina, though, appears and blocks their return path. She worries that if Triton lifts the ban on music, he will release Sebastian, restore him to his position, and she will be demoted. She and her minions (electric eels) fight Ariel, Sebastian and the others in a final showdown. Ariel gets knocked out, but Triton happens by and sees what is going on. The entire incident makes him think long and hard about the whole music issue. 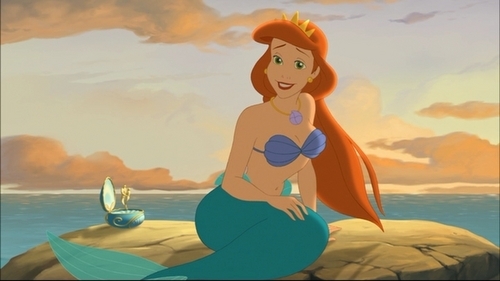 In this "The Little Mermaid," Ariel the little mermaid (Jodi Benson, who since has gone on to roles in the "Toy Story" franchise besides the two sequels to this film), is the youngest daughter of King Triton (Kenneth Mars). She is dissatisfied with her life in the sea. In a classic case of "the grass is always greener," she longs to live with the humans who walk on land. 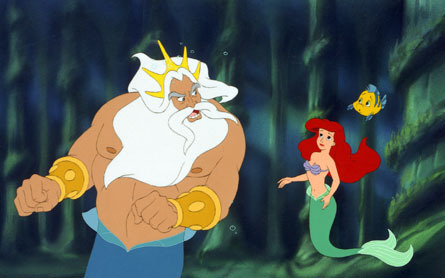 As a result, Ariel the little mermaid often argues with her father King Triton over her desires to be with humans. He calls them "barbaric fish-eaters," which actually isn't too far from the truth. 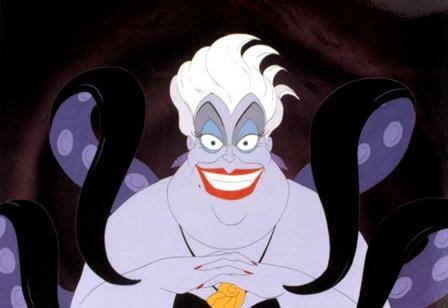 One day, Ariel the little mermaid goes to meet Ursula, the Sea Witch (Pat Carroll). Ursula the Sea Witch and Ariel the little mermaid strike a deal which may enable Ariel to realize her dreams. Ariel the little mermaid's part of the bargain, though, may not be exactly what Ariel thought it was when she made it. Animation characters always have to be careful about the terms of bargains they strike with their pals, because the results often don't turn out the way they thought. Just ask Shrek in "Shrek Forever After." Ursula's deal with Ariel the little mermaid turns Ariel into a human for three days in return for Ariel giving Ursula her voice for that time. Ursula carefully puts the voice in a nautilus shell for safe-keeping. If Ariel receives the "kiss of true love" in that time (see Snow White and the Seven Dwarfs" and "Shrek Forever After"), then she may stay on land; otherwise, she reverts to being a little mermaid and becomes Ursula's slave. Ariel the little mermaid hurries to the surface and quickly finds her man, Eric, walking on the beach. Ariel the little mermaid makes terrific progress with Eric, but Ursula doesn't want to lose this bet. She gets her minions to disrupt things, and she turns herself into a beautiful young girl complete with Ariel's voice. Eric, befuddled, believes that Ursula is the little mermaid who saved him, and so he drops Ariel the true little mermaid for the imposter Ursula. Ariel the true little mermaid disrupts the wedding of Ursula and Eric and in the process recovers her voice, showing Eric that it indeed she, Ariel the little mermaid, who saved him. Unfortunately, the sun sets before Eric and Ariel the little mermaid can kiss and thus help Ariel win the bet with Ursula. Accordingly, Ariel the little mermaid turns back into her true form and becomes Ursula's slave. 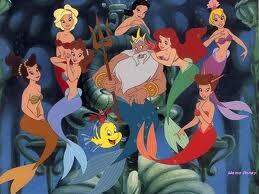 King Triton can't allow this, so he places himself in Ariel the little mermaid's place so that she may go free. This makes Ursula the new ruler of Atlantica, and she immediately uses her new-found power to destroy Arield the little mermaid and claim Eric for herself. A tremendous battle ensues, and everyone's fate hangs in the balance as Ursula, Eric and Ariel the little mermaid battle for control of the oceans. Ariel returns to her undersea ways in "Little Mermaid II"
Ariel (Jodi Benson) and Prince Eric (Rob Paulsen), together since the demise of Ursula at the end of "The Little Mermaid," have a daughter, Melody (Tara Strong) on a ship. Ariel's father, King Triton (Kenneth Mars), presents Melody with a special locket. Ariel, though, decides not to tell Melody of her sea heritage, and tosses the locket in the sea and builds a wall between the castle and the water. Morgana (Pat Carroll), Ursula's sister, wants Triton's trident, which gives power over the creatures of the sea, so she almost manages to kidnap young Melody. Ariel and Eric work against her to foil her plot. When Melody is twelve, she goes swimming against her mother's orders and finds the locket, which has her name on it. When Ariel refuses to talk about it, Melody runs away from home by boat. Ariel, frantic, has Triton turn her back into a mermaid in order to search for her. News of Melody's departure soon reaches Morgana, who lures Melody to her lair with the help of Undertow (Clancy Brown) and her manta minions Cloak and Dagger. She transforms Melody into a mermaid, who is happy to become one. 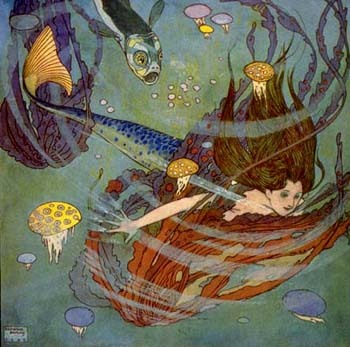 Melody steals Triton's trident, which Morgana says will enable her to remain a mermaid forever. With the trident, Morgana becomes power-mad just as her sister did while in possession of the trident. 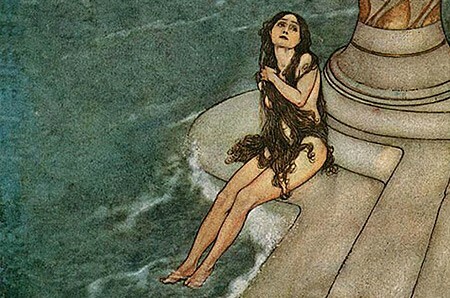 After capturing Ariel and holding her hostage, Morgana rises to the surface to proclaim her power. Eric and his allies Triton, Sebastian the crab (Samuel E. Wright) and Scuttle the seagull (Buddy Hackett) arrive to rescue Ariel. 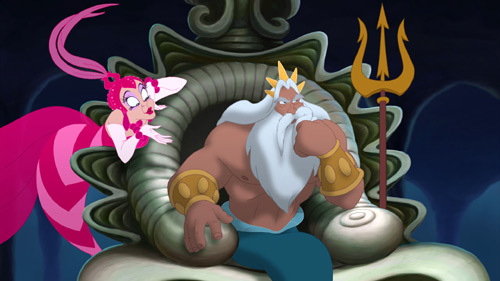 Melody, wishing to save her mother, helps to overpower Morgana, and Triton recovers his trident. Triton then offers Melody the opportunity to become a mermaid permanently if she wishes, but Melody has a better idea. Disney finally announced release of a Blu-ray version of "The Little Mermaid." This will be the long-awaited "Diamond Edition." It will come out on October 1, 2013 in the United States in multiple versions. Unfortunately, there is no overseas release date yet. Mermaid will be released in four different versions: A Blu-ray/DVD Combo in BD packaging (top), the same set in DVD packaging, a Blu-ray/DVD/Digital Copy Combo and, confirming previous rumours, a Blu-ray 3D/Blu-ray/DVD/Digital Copy/Music Download Combo. Below is Ariel The Little Mermaid singing one of her most-loved tunes.